« Kung Fu Panda: The Board Game – Play It At Draughts! Draughts’ First Ever 7 Wonders Tournament! Are you a natural born leader? Can you take charge in the building of your very own civilisation? Have you got what it takes to crush your opponents and come out victorious? Then this is the tournament for you! We are looking for entrants of all skill levels for this very friendly (yet still competitive!) tournament of one of our favourite games ‘7 Wonders’, where the goal is to draft building cards and gain the most victory points at the end of the three Ages. 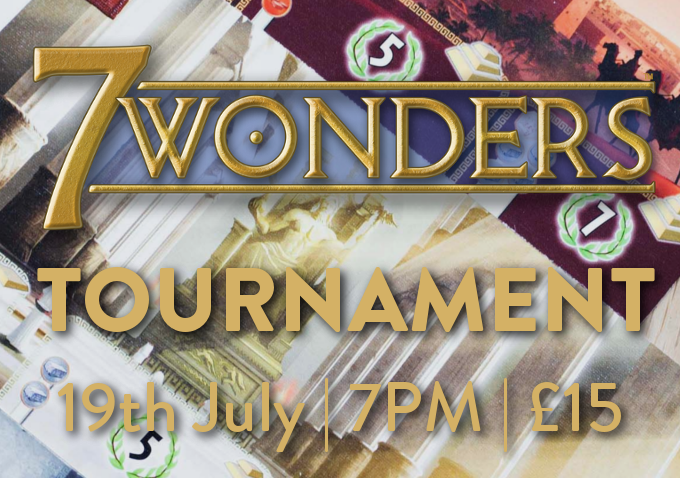 Through clever selection and a bit of planning, you could end up winning some seriously cool prizes, including a copy of our favourite game 7 Wonders Duel and some bonus extra stuff too! Each entry gets a free drink from our selection to start you off in the right way; building a civilisation from scratch is thirsty work!